Over the centuries, Turkey has had many constitutions and can be characterized by the steady establishment of a nation-state, democratization and recognition of international law. The Turkish constitution was ratified in 1921, revised in 1924, 1961, 1982, and most recently in 2010. A proposal for yet another constitution is being discussed, to allow Turkey to comply with EU accession political criteria. ↑ The Grand National Assembly of Turkey (2016-07-15). "Constitution Of The Republic Of Turkey" (PDF). 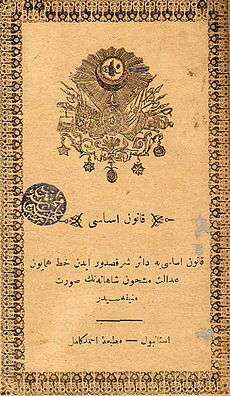 Constitution Of The Republic Of Turkey. The Grand National Assembly of Turkey. Chapter Three, Section I, Article 41, Para 3-4. Retrieved 2016-07-15. ↑ "Draft proposal" (in Turkish). 2007. Retrieved 2008-01-01. ↑ Yavuz, Ercan (2008-01-01). "New constitution to dominate 2008". Zaman. Retrieved 2008-01-01.